Guys, long time, no see. Was away in Korea, trying to earn my bread, rather my inedible veggie noodles. I made this HD movie with the Canon 5D MkII. Shows me how hard it is to make videos. Kudos to all those who lug heavy cameras and produce the best of the best. Barcelona, where lived Picasso for many years, boasts many cultural wonders. You should see the funny Woody Allen movie, Vicky Christina Barcelona to soak up the mood, music and sights of this busy city. 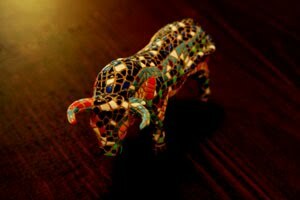 When I visited their arts village, I bought this ceramic bull in Gaudi colours. And the compelling music I have added in the YouTube video comes from Percussions II. This entry was posted on September 27, 2009 at 1:50 AM	and is filed under the Bull Picasso Percussion Barcelona Woody Allen Vicky Christina Barcelona Gaudi. You can follow any responses to this entry through the RSS 2.0 feed. You can leave a response, or trackback from your own site.